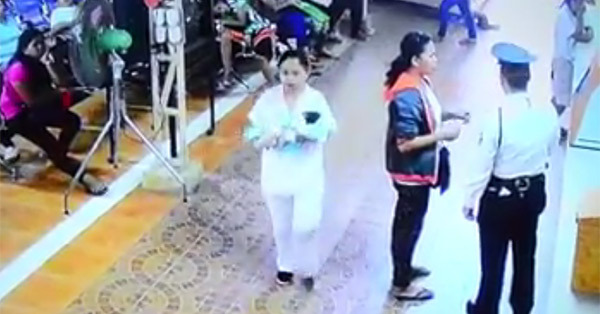 Video captures a woman who turned out to be a fake nurse kidnapping a newborn baby at the Vicente Sotto Memorial Medical Center in Cebu City. A closed-circuit television (CCTV) footage from Sunstar shows the female suspect bringing the baby out of VSMMC, a government-owned general, tertiary medical center teaching/training medical facility. In the video, the kidnapper easily passes through security as she abducts Prince Niño, son of Jonathan and Rosalina Celadenia, without a sweat. According to the Utan Bisaya Facebook page, VSMMC director Gerardo Aquino said during an interview that he is willing to give a monetary reward to anyone who can provide information about the identity and location of the woman who pretended to be a staff of the hospital. A police investigation is underway.